As a simple soul whose number one interest in working with social enterprises, CICs and charities is in creating impact, anything that is too finance-y or uses legalese sends me running for the hills. But the longer I work in the social investment world, the more I realise it doesn’t need to be that complicated. As part of Big Society Captial ‘GET SITR’ campaign, we were delighted to publish the first of our Simple Guides. In a simple case of first-hand user testing, I use myself as the benchmark. I have no financial, accountancy, tax or any other professional service experience, but I have run a social enterprise for five years and sold ladies fashion for many more than that! The guide is straightforward and clear: if I can understand it then I believe it passes the simple test. So after the “what is it question”, one of the most frequently asked is: what about the other tax reliefs like EIS, SEIS and CITR? Can I use two different tax reliefs as part of the same deal? Which tax relief is better or most suitable for the type of investment I am trying to achieve? Can organisations as well as individuals benefit from using a tax relief? It was definitely time for another simple guide! ‘A Simple Guide to Tax Reliefs for Charities, CICs and Social Enterprises’, answers these questions and more. There are many potential tax reliefs for investing into charities, CICs and social enterprises, but the rules can be complex and difficult to put into practice. I hope this briefing gives charities, CICs and social enterprises the confidence to explore the potential of these reliefs. It is so frustrating that tax reliefs are complex - we can’t all be lawyers or tax experts! The role of ‘GET SITR’ helps to translate the opportunities that tax reliefs can play. Hopefully this guide will help to bring us one step nearer to supporting investment into CICs, social enterprises and charities (or donations in the case of gift aid). If the way ahead is just a little simpler, it will be a job well done. 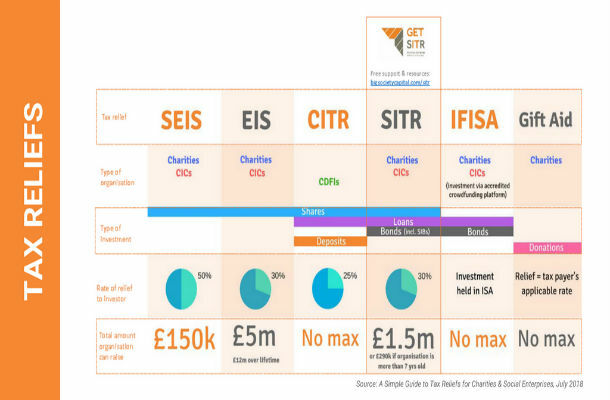 ‘GET SITR' is a campaign offering free resources and support to help more charities, CICs and social enterprises raise investment using Social Investment Tax Relief. The campaign is a joint initiative led by Big Society Capital in partnership with the CIC Regulator, Power to Change, the CIC Association, the Community Shares Company and the Community Shares Unit.